I must have heard a banjo before the first episode of The Beverly Hillbillies but I don’t recall the circumstances or if it even registered as “banjo” in my young brain. But it was shortly before I became infatuated with the Kingston Trio and particularly banjoist Nick Reynolds. My seventh grade girlfriends and I bought identical striped shirts, begged our parents for guitars, and spent summer afternoons trying our hands at folk songs. Even then we overlooked the banjo’s role in the Trio, concentrating on what looked like an easier route to stardom through the guitar. By 8th grade the Kingston Trio gave way to Peter, Paul and Mary, and soon after, the Beatles. I didn’t think about the banjo again until the famous “Dueling Banjos” track pushed the film Deliverance to the top of the soundtrack charts in 1972. My immersion in folk music was fairly short-lived, and after brief encounters with every other genre in my 20s and early 30s, I found my way back to my earlier delight in jazz. The banjo did not come along—neither did that guitar that I never really learned to play. I was vaguely aware of Bela Fleck and the Flecktones, and despite a Pete Fountain record dating back to my tenth birthday, I was even less aware of the role of the banjo in early jazz bands. This past summer, I received a review copy of the delightful duet recording from Bela Fleck and Chick Corea (The Enchantment, aptly titled). It didn’t sound anything like bluegrass or 60s folk. Then I got an email from jazz banjoist Cynthia Sayer, inquiring as to my interest in reviewing a CD she had just issued with a distinguished cast including guitarist Bucky Pizzarelli, trumpeter Randy Sandke, and multi-reedist Scott Robinson. Given the company she was keeping, I felt it would be worth my while to check out the recording. It was. 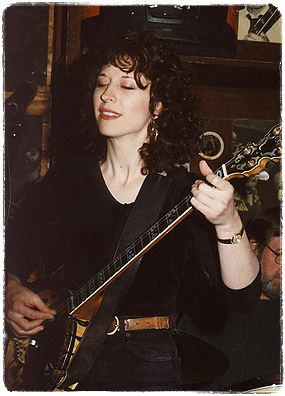 But the value of Attractions (Plunk Music) was not limited to the dozen tracks of swing, hot club magic and even a tasty transformation of Franz Liszt—Cynthia convinced me, through her music and our email exchanges, to look into the history of the banjo and its current status within jazz. The new music emerging from New Orleans, particularly ragtime, provided another niche for the banjo, which was now splitting into two instruments –the original five string and the new 4-string or “plectrum.” Well, actually there were two types of four-string banjos as Cynthia recently pointed out to me: In addition to the plectrum, "the other kind is tenor banjo... initially used in the jazz bands (pitched and tuned like a viola). The plectrum was initially evolved as a soloist instrument, and was heard playing everything from classics to comedy on vaudeville stages, etc., but soon they were interchangable, and to this day both kinds play jazz, do solo work, etc." With one less string and strings now made of steel, the banjo could be heard in the midst of the horns of “Jazz Age” bands. Unfortunately, when America’s financial fortunes plummeted in 1929, so did the fate of the banjo. Parlor music was now unaffordable; big bands hired guitarists. And it seems everyone forgot that the banjo was once a popular jazz instrument. The banjo has made a comeback of sorts, dating back to the new interest in folk music and bluegrass in the 50s and 60s. Then along came Bela Fleck, who as a young guitarist was inspired by—of course--The Beverly Hillbillies and Flatt & Scruggs to pick up the banjo, and by Chick Corea to bring the banjo to bebop and beyond. Meanwhile, or maybe a while later, 13-year-old pianist/violist/singer Cynthia Sayer asked her parents for a drumset and instead received a banjo. It may have seemed like an odd alternative at the time, but Cynthia was sufficiently intrigued. Today her credits read like “everyplace you could possibly play a banjo”—with Woody Allen’s New Orleans Jazz Band, as the official banjoist of the New York Yankees, as a guest on Marian McPartland’s Piano Jazz, as the soundtrack to numerous commercials and film scores. But jazz is her passion, even if, among the jazz community, the banjo is still clawing for respect. Cynthia Sayer isn’t just another pretty face in front of a microphone. She’s a true jazz rebel, a “freedom fighter” hoping to convince audiences and musicians alike to give the banjo its due. And she’s fighting a double-edged sword of prejudice. Women still lack parity with men as jazz instrumentalist. If a woman says she is a jazz musician, the usual assumption is that she sings. And if not a singer, maybe a pianist. Few women have entered the upper echelon of jazz as saxophonists, trumpeters, trombonists, bassists or drummers… and certainly not as banjoists. And gender aside, the banjo today is seldom heard in a jazz context save Bela Fleck. One would think that a musical genre that has embraced the harmonica and accordion would have room for the banjo. Pick up a copy of Attraction to hear Cynthia reinvent swing. The banjo is as well suited to Berlin and Arlen as to Flatt and Scruggs.